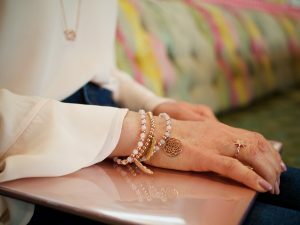 The office isn’t necessarily the place for noisy bangles clunking together nor large chunky bracelets that are obtrusive and irritating clinking against your desk, so choose a stylish single bracelet that will add some sophistication and charm to your corporate outfit, that sits well at the end of a jacket sleeve. 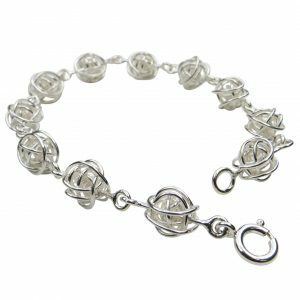 A simple chain bracelet with a single charm will do this job very well or go for something with a little more interest and texture, with understated sophistication. 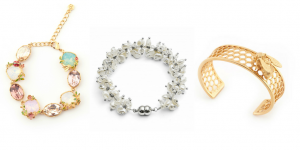 Bracelet stacking is a continuing jewellery trend that is likely to remain with us for some time. It allows you to showcase your individual style and can be great fun mixing colours, widths and styles to team with most outfits. Getting started with stacking is effortless; just start with 2 or 3 and build up! First, choose a theme such as colour or materials and choose bracelets that complement each other but don’t match each other perfectly. Take care when mixing different metal colours as this can look haphazard if not done thoughtfully. However, if you have gold rings (wedding/engagement rings for example) don’t feel you have to stick to gold on your wrist or anywhere else for that matter. 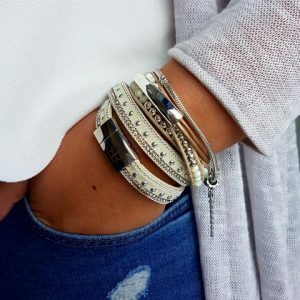 Large stacks of bracelets ideally should be worn with much simpler outfits so as not to look cluttered. A good rule of thumb is the larger the stack the simpler the outfit. Go ahead, experiment and have fun – the options are really endless! For high impact but no fuss try a cuff such as Chris Lewis Wound Silver Cuff (featured at the top of this blog) which would add a touch of class to any outfit for that special dinner date, as would the beautiful Keisha Pearls bracelet pictured below along with a couple from Bill Skinner for a slightly more quirky but nonetheless ‘dressed up’ look. Sometimes though you just have to go all out for glam and sparkle for those extra special dates or party nights and Nour London have the perfect solution without breaking the bank! 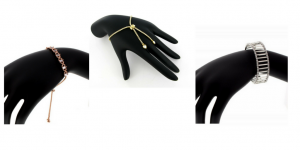 I hope this helps you to wear bracelets with greater ease and will be front of mind the next time you’re looking to put that finishing touch of chic to your outfit. 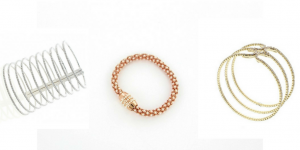 Choosing timeless bracelets will give you tons of options as they can be worn again and again!